Friday May 19th 1893 I baked bread this morning and we did quite a large washing. Fanny was over the river After dinner she took me over to visit with Dentons folks. and she brought me back about four oclock. She and Ott stayed over thee toll after supper. I worked on my tidy in the evening. Saturday May 20th 1893 I got the breakfast alone while Josie ironed. I nearly finished the ironing while she did up the work. I went up town before dinner and was busy all afternoon changing some things about in the house. fanny went over the river. Will and I went after supper to Marys for milk and up home for a chicken. wethr very warm. 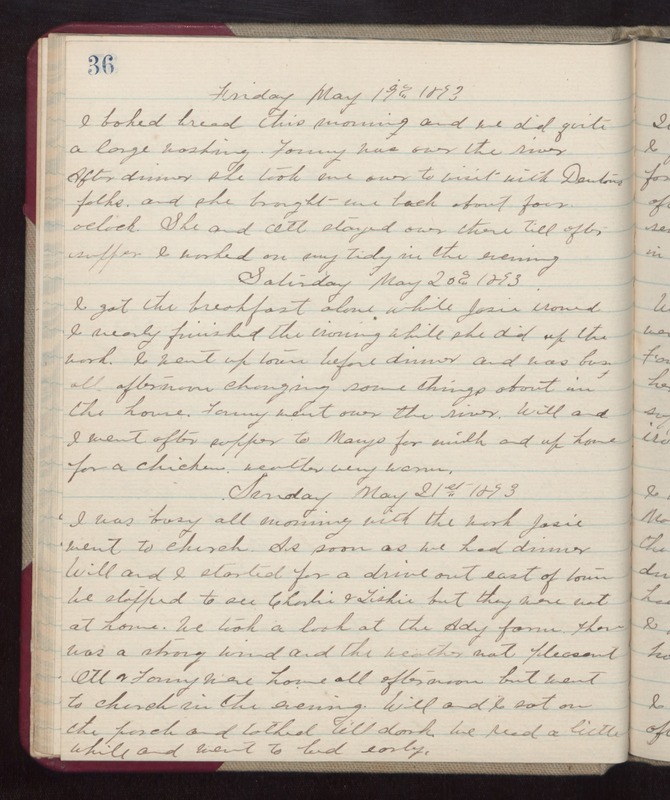 Sunday May 21st 1893 I was buys all morning with the work. Josie went to church. As soon as we had dinner Will and I started for a drive out east of town. We stopped t see Charlie & Tishie but they were not at home. We took a look at the Ady farm. Thee was a strong wind and the weather not pleasant. Ott & Fanny were home all afternoon but went to church in the evening. Will and I sat on the porch and talked till dark. We read a little while and went to bed early.